A host of brands including Pepsi, Ford and Toyota are making a commotion around a key date in Generation X's cultural calendar. Children of the 1980s will be feeling older this week when 21 October 2015 flashes up on their Apple Watch / Outlook / Filofax. In the fondly-remembered time travel movie Back to the Future Part II, released in 1989, this was the date the hero Marty McFly (played by Michael J Fox) leaped forward to in an attempt to get his future son out of trouble. 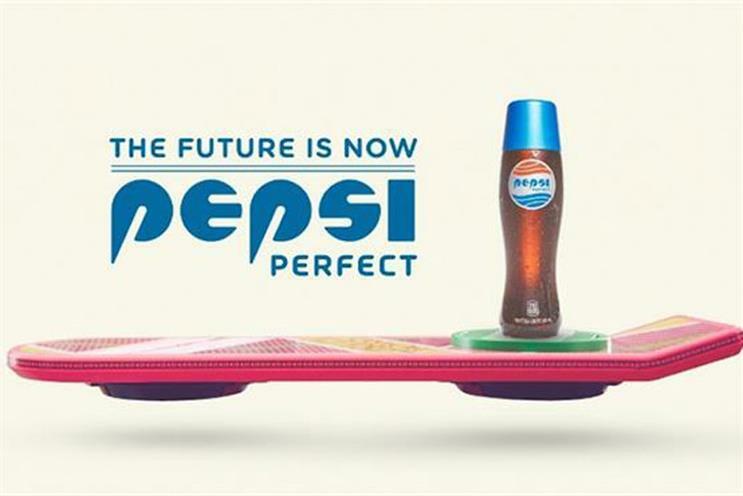 The film’s comic imagining of what would be cool for the next generation offered up hover boards, flying cars and self-lacing boots, as well as some light-hearted product placement. Marketing presents an A-Z of brands that either featured in the film or are doing their best to associate themselves with it now. In the movie: AT&T’s name was put to a video communication system installed in the McFly family home, at a time when the telephone was about the most advanced widely-adopted technology. Now: Radio silence so far. In the movie: Ford provided some of the ‘futuristic’ cars, which according to the Back to the Future Wikia consisted of the 1989 Ford Probe model modified with a massive darkened windshield and concealed rear wheels, and soundtrack editing to give the impression the cars made very little noise. Now: Ford has created a mock product video for a ‘flux capacitor’ upgrade for the Fiesta and Focus, the technology that made time travel possible in the films. Now: Lexus scored a publicity coup this year by bringing the world a working version of a hover board, which the film portrayed as the future of the skateboard. Now: Mattel has been quiet, perhaps for good reason. Three years ago it released a $120 (£77.50) prop replica Back To The Future hover board, which was crowned ‘Worst Toy of 2012’ by Gizmodo. Now: In 2012 Nike released a limited edition run of Nike MAG shoes modelled on those in the film, but without the self-tying laces. Earlier this year Nike designer Tinker Hatfield said his team was working as hard as possible to deliver a new edition with the laces in 2015, but nothing has been heard since. In the movie: As well as various appearances of real Pepsi drinks, there is a fictional variant on sale in 2015 called Pepsi Perfect, which has added vitamins. Now: Pepsi is celebrating by releasing a limited edition run of a few thousand bottles of Pepsi Perfect in a collector’s case, though the drink inside will be Pepsi with real sugar rather than vitamins. It has created this ad to draw attention to the stunt. In the movie: A Toyota pick-up truck makes a brief appearance at the point where the first film ends and the second one starts. Now: Toyota has created a campaign tying together its forthcoming launch of the Mirai, a car that runs on hydrogen fuel cells, with Back to the Future Part II’s vision of cars running on fuel cells powered by rubbish. Three teaser ads, one featuring Fox and the other star of the series, Christopher Lloyd, who played Doc Emmett Brown, have been released to preview a five-minute video that will be published on 21 October. In the movie: In a movie in-joke Marty McFly sees an advert in 2015 for a holographic 3D film called Jaws 19. Universal was the studio behind the Back To The Future series as well as the 1980s shark films, which had recently flopped with Jaws 4 (Jaws: The Revenge). Now: As part of its efforts to promote the anniversary box set of the Back To The Future trilogy Universal has created a new trailer for Jaws 19.